We're passionate about tiling and enjoy coming up with innovative solutions to suit you. We have an eye for detail and strive for perfection in all aspects of our work. 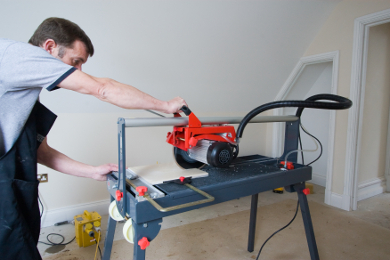 For advice and a free estimate or use our form for a quick reply. Profix Ceramics have industry recognized NVQ CSCS qualifications with over 35 years experience in the trade, we are covered by public liability insurance & are a member of the Tile Association (TTA) for your peace of mind. Having started out as a 16yr old & serving time as an apprentice tiler, you can rest assured that you are in very capable hands with john, having learned the art of tiling under strict supervision & fine tuning that art for over three decades. We cater for all aspects of tiling, domestic & commercial from a basic kitchen or bathroom tiled splasback to mosaic tiled wetroom seats. John is skilled in using all the different tiles available on the market today, ceramic, porcelain, mosaic, quarry, travertine, marble & quartzite to name just a few & in all size formats, shapes & patterns. Profix Ceramics is not just equipped with the tiling skills but is also equipped with all the latest tool technology to complete the toughest of tile installations with tungsten, titanium & diamond cutting edges that cut & drill with the utmost precision. We can supply tiles with installation included or just installation only as suits your needs. If purchasing your own tiles please browse my links page for websites that may help you in choosing your tiles, designs & colours. 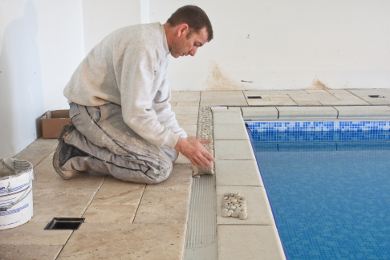 Installation only includes labour, adhesive, grout & any edging trims that may be required, this leaves you free to concentrate just on the tiles of your preference. 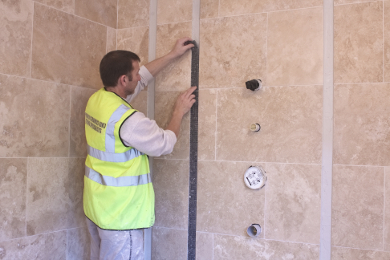 Profix Ceramics rarely charges by the hour for the tile installation. Unless the job is complex or requires a vast amount of prep work the majority of the time it is worked out by the meter & is a fixed price so you will never get billed more than what you expect or quoted which helps to keep things within your budget. "Very Professional, Prompt, Clean, tidy & faultless work. We are so pleased we recommended john to our son in Tattenhall & he has since completed another fantastic job for him & also for two of our neighbours." "We had trouble with a tiler we hired for our kitchen floor tiling, thankfully john came to the rescue at short notice as we had a deadline due to the following trades needing to progress & we needed the kitchen fitting! John came, prepped & tiled the floor with no fuss at all & kept the job on schedule. We are so pleased we have already booked him to do the kitchen wall tiling & also our new wet room." "We had John to complete some tiling at our house that we recently moved in to, we highly recommend john for his competitive prices, top class workmanship, he is very neat & tidy & along with his attention to detail it's no wonder he is in demand. Just wish we had him for the tiling in the annexe. Will definitely use John again." "We unfortunately got a cowboy tiler to tile our kitchen walls, simple straight forward job but he made a terrible mess of it! We were horrified & had to get in touch with trading standards to sort it out. Luckily we only lost the money on the cost of the tiles but suffered with the stress & hassle of it all. We contacted the Tile Association (TTA) & they put us in touch with john at Profix Ceramics. Wish we had contacted him in the beginning, the finished job was superb with no hassle & completed very quickly, highly recommended." For advice or a free, no obligation quotation, don't hesitate to call John on 01352 755 551 or fill in the form on our contact page for a quick reply!